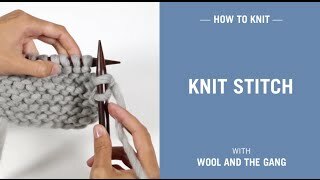 Garter stitch is the easiest stitch to make in knitting, basically row after row of the knit stitch. Easy to knit, and creates a 'wave' effect. Perfect for big chunky scarves such as as 'Foxy Roxy' and cardigans such as the 'Vivienne Cardigan'. If you're learning garter stitch as a beginner, a handy tip is to count the number of stitches after each row. This is to ensure that you haven't accidentally created new stitches. 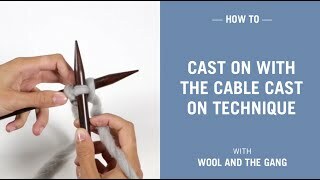 Wrap the yarn around the needle clockwise. Scoop the needle towards you. You now have a new stitch on the right needle. Release the old stitch off the left needle. Keep repeating these steps to knit the rest of your row. When you get to the end of your row, swap the needles around. Repeating these steps for each row of knitting creates garter stitch.